The world is a storybook of unrivaled diversity, whose tale is only told by those who are willing to venture out and turn the page. 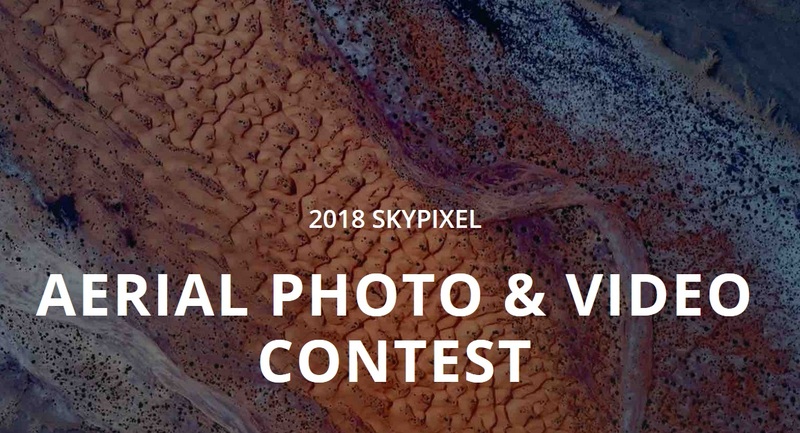 Enter the 2018 SkyPixel Aerial Photo & Video Contest to tell your own unique story and get a chance to win incredible prizes. Content that has been previously awarded a prize in other SkyPixel contests can’t be used again in this contest. Participants must guarantee that all information provided is accurate and that all the content was taken by themselves. Inaccurate information may lead to disqualification. A single entry may only be submitted for a single category. The same entry is not permitted for submission in multiple categories. Inspire 2 Professional Combo , Zenmuse X7 DL/DL-S Lens Set, Mavic 2 Zoom, Mavic 2 Pro, Mavic 2 Fly More Kit, Ronin-S, DJI Goggles Racing Edition, Mavic Air Fly More Combo, Spark Fly More Combo, Manfrotto Stile Spark/Mavic Small Messenger Bag, DJI Credit, Ryze Tech Tello, Osmo Pocket, Osmo Mobile Carrying Case and the Osmo Mobile 2. Prizes can’t be exchanged or refunded unless the product has manufacturing defects, or sustains damage in transit, which was found when the product was unpacked and checked in the presence of the courier. One Hasselblad X1D Medium Format Mirrorless Digital Camera (Silver, Body Only) and an XCD 3,5/45 lens. Prizes cannot be exchanged or refunded unless the product has manufacturing defects. Pelican EL22 Elite Carry-On Luggage Case with Travel System, Pelican U160 Urban Camera Backpack, PGYTECH Accessories Combo for MAVIC 2 ZOOM（Professional）, PGYTECH Accessories Combo for MAVIC 2 PRO（Professional）, Pelican #1400 Case, PGYTECH Accessories Combo for MAVIC AIR (PRO), Pelican 22 oz Traveler Tumbler, PGYTECH Accessories Combo for SPARK（Standard）, Pelican SD Memory Card Case, and PGYTECH Carrying Case for TELLO. The sponsor is responsible for shipment and aftersales services. Any quality guarantee (if any) of the prizes was provided by the third-party supplier, Entrants shall read the instructions and use the product as instructed, the Organizer shall not be responsible for any damages that caused by misusing of the products. Open for any aerial content shot with a drone. By entering into the Contest and submitting an Entry, each Entrant hereby grants to the Organizer and its affiliates, and the Organizer and the affiliates hereby accepts, a non-exclusive, irrevocable, royalty-free, worldwide, perpetual, sub-licensable and transferable license to use and exploit the Intellectual Property Rights subsisting in his/her respective Entry(ies). The license under this provision shall provide to the Organizer, its affiliates, and its transferees and sublicensees, to the extent transferred and sublicensed by the Organizer, the right to edit, publish, print, use, adapt, translate, exploit, modify, include in a compilation, copy, disseminate, dispose, load onto its server, broadcast and/or transmit each Entrant's Entry (including photos, videos, etc.) for advertising, promotional, display and/or publicity purposes, and to use the Entries for any and all purposes connected with the Contest and the Campaign Website without any compensation for, further permission by, or notification to the Entrant. Each Entrant also hereby grants each visitor to the Campaign Website a non-exclusive license to access an Entrant's Entry and to view, use, reproduce and/or distribute such Entry for entirely personal recreational purpose.